The 2017 Annual Security Report released by Campus Safety shows a mixed bag of results, with some law violation categories rising while others fell, leaving Campus Safety Chief Mike Pasqualicchio feeling “pretty good” overall. “The numbers in 2017 weren’t outrageous or anything, so I don’t see any major issues,” said Pasqualicchio. The report breaks down the locations of offenses into on-campus, residence halls, public property and non-campus categories. The 2017 report shows six arrests made for liquor law violations in residence halls and on campus compared to none in those locations in 2016. Disciplinary referrals for liquor law violations in residence halls and on campus also increased to 122 last year from the previous year’s 64. 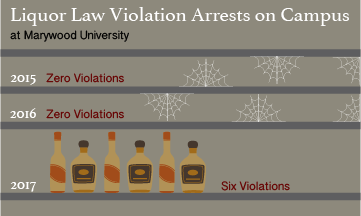 Two non-campus arrests occurred for liquor law violations in 2017, compared to no arrests in 2016. However, there was only one non-campus disciplinary referral for a liquor law violation in 2017, a drop from eight in 2016. In 2017, disciplinary referrals for drug law violations on campus and in residence halls dropped to eight, down from 12 in 2016. 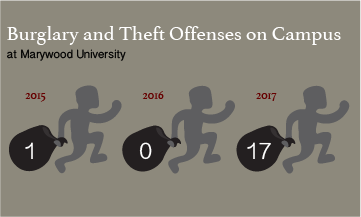 The report shows 17 thefts on campus in 2017. There were no thefts in the same category the previous year. The report also lists no thefts in residence halls, on public property or in non-campus areas in 2017. Pasqualicchio said he believes the best way to lower theft on campus starts with the students. “It all comes down to people being more aware of their surroundings and keeping track of their personal belongings,” said Pasqualicchio. 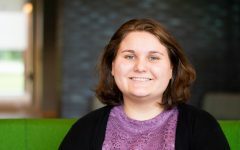 According to the report, Marywood releases this information each year to comply with the Jeanne Clery Disclosure of Campus Security Policy and Crime Statistics Act. The full 2017 report is available on Marywood’s website.